There was one, now there are many, options to create mini Web sites all on the iPhone. 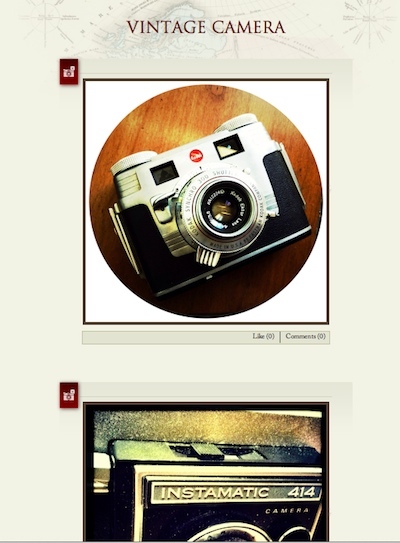 Initially, these were sites that a person could use to easily add images and text via their iPhones. Now, sites can be text, links, and images – shared or private, and others can be invited to add content too. Sites can quickly be created for an event, trip or just items of interest. Multiple people at a event, like a soccer game can share in the creative work, adding scores, highlights and images. Using the Free Zapd iPhone app, sites created are viewable with any browser across the many devices like iPhones, iPad and desktop computers. 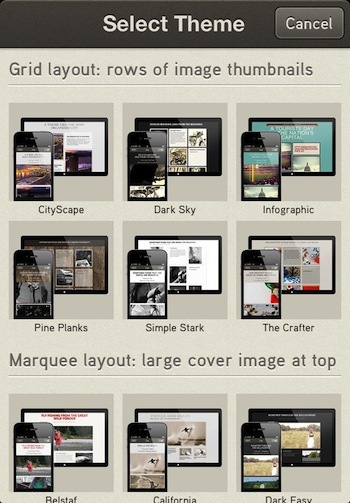 Create as many Web sites you like, all with the iPhone. Name each, add tags, and update as you like. Zapd assigns a URL that is your account ID, Zapd, then the site name. Since each site has a unique URL, you can always have another vanity URL forward to one your create and maintain with your iPhone. Choose a theme and category for each site. Themes offer different fonts, layouts and coloring. Some may appear slight on the iPhone but may appear more dramatic when viewed with a desktop browser. Zapd does offer a few themes that carry an extra in-app charge. 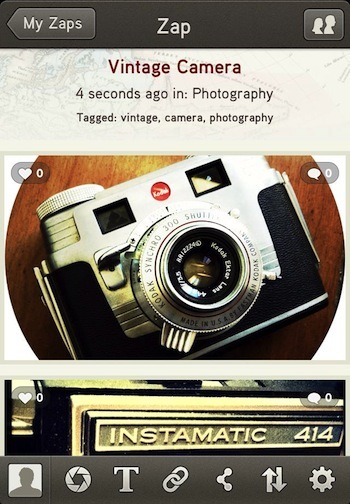 Adding text, links and photos within the Zapd app to your sites is quick so updates are easy when on-the-go. 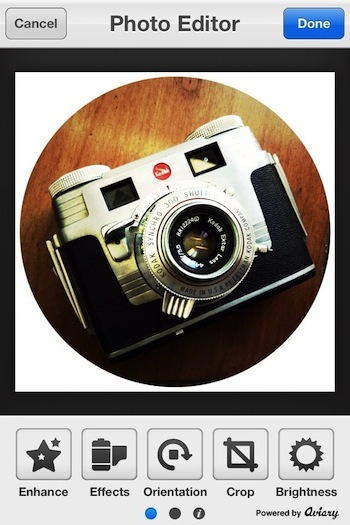 There are light photo editing tools available. 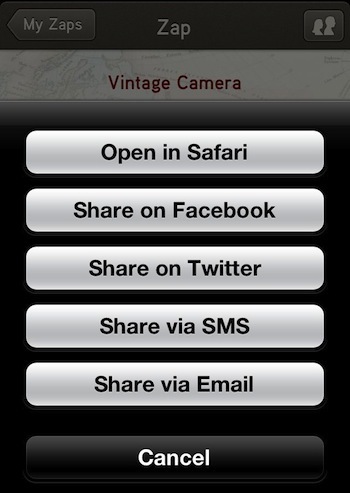 In the Settings for each site you build with your iPhone, you can choose if the site will be Private or Public viewable. Sharing is built into Zapd so that you can invite others to view or even add to the site. Zapd recently sent an email mentioning a Holiday Content. Below is an outtake of that email. 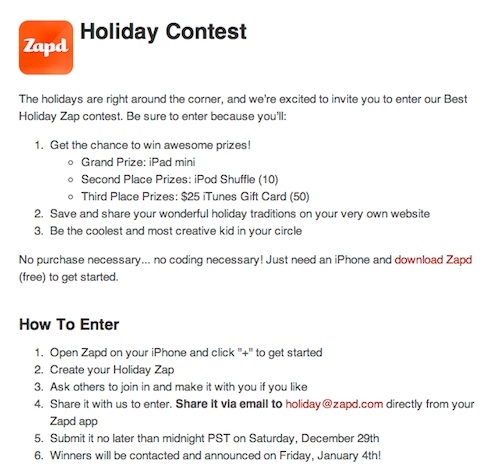 If you are taking holiday photos, why not post up on a Zapd mini site to share with family and friends? Then let the Zapd staff know about it via the method shown below… good luck!